Scholars have devoted far less attention to the planning of World War III in East Asia than to the European theater. The two classic novels of the Third World War (Tom Clancy’s Red Storm Rising and John Hackett’s The Third World War) rarely touched on developments in Asia. However, in the 1970s and 1980s, the Naval War College traced the potential course of war in East Asia as part of a series of global war games. These games lend a great deal of insight into the key actors in the conflict, and how the decisive battles of a Second Pacific War might have played out. How would China have reacted to the onset of a war between NATO and the Warsaw Pact? Beijing certainly regarded the survival of NATO as critical to its security from the 1970s on. The existence of NATO prevented the USSR from concentrating the bulk of the Red Army and of Soviet strategic aviation against China; a Soviet victory in the West would have put China in great peril. By the 1980s, China stood at a massive technological disadvantage against the USSR. Moreover, Beijing worried (perhaps rightly) that even if the USSR held its nuclear fire against NATO, it would view a strategic exchange with China as less risky. Thus, there was no guarantee that China would open a second front against the USSR. Japan combined extraordinary economic strength with significant military power and a crucial geographic position. A Japan committed to the United States could effectively prevent the sortie of the Soviet Pacific Fleet, while enabling attacks against the Soviet Far East. A neutral Japan limited these options, but still provided the NATO alliance with a strong economic foundation in case of a protracted war. Washington had the advantage; it only depended on how and how much. Would North Korea have joined a general Soviet war against NATO by invading South Korea? Such a move would have put extraordinary pressure on U.S. forces, although by the 1980s South Korea could probably survive with only measured U.S. assistance. However, Pyongyang answered to two masters; it required the support of both Beijing and Moscow. Given the unlikelihood that China would support a Soviet war against NATO, the prospect of Beijing’s acquiescence in a second Korean War would have been extremely sketchy. The Soviets had an ally in Hanoi, but no means to support that ally against either China or the United States. Moreover, the Vietnamese had little to gain from joining a conflict; they were substantially controlled by Laos and Cambodia, and could do little more than harass shipping lanes in the South China Sea. However, given the bloody nose that Vietnam had inflicted on both countries in 1975 and 1980, neither Washington nor Beijing would have had much interest in reopening the conflict, especially with far more pressing issues at hand. That said, Vietnam could still make some mischief with U.S. allies in the region, and the PRC still had scores to settle. The Soviets took the Pacific seriously. 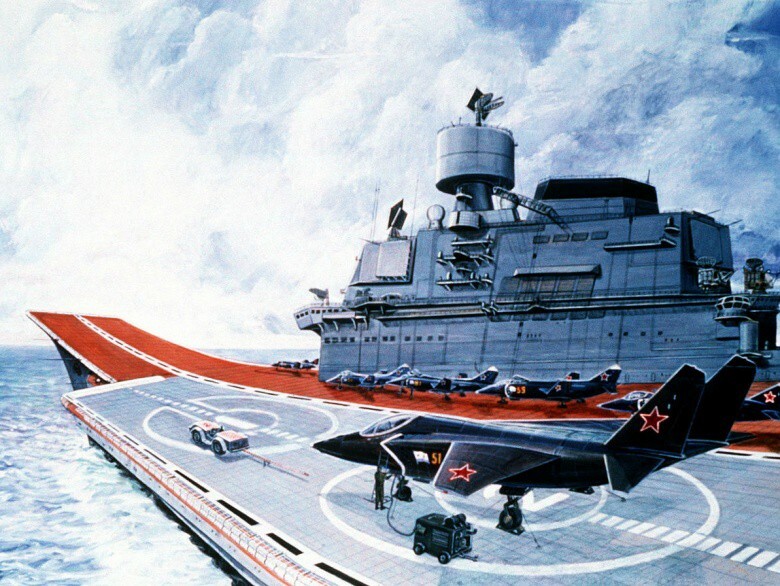 By the 1980s, the fleet included two Kiev-class aircraft carriers, and one Kirov-class battlecruiser. In peacetime, the ships of the fleet sailed widely, regularly visiting Southeast Asia and even the Indian Ocean. Wartime, however, would have tightly constrained their operations. The Sea of Okhotsk served as a bastion for the SSBNs of the fleet, and naturally as a target for U.S. attack. Soviet objectives would have included the neutralization or defeat of Japan, the defense of the Russian Far East and potentially the penetration of the Pacific in order to attack maritime supply networks and distract U.S. attention from Europe. The United States Pacific Fleet commanded the balance of power in the region. With several carrier battlegroups supported by a variety of amphibious assault ships, battleships, nuclear attack submarines and a large array of land-based aircraft, the U.S. Navy could have undertaken both offensive and defensive operations to control the pace and course of the war. Moreover, the Japanese Maritime Self Defense force and the Royal Australian Navy could have both offered extensive support to the Americans. The central objectives for Allied naval forces would first have been to detect and defeat any Soviet efforts to penetrate attack submarines into the Pacific or Southeast Asian shipping lanes. Second, the U.S. Navy had taken upon itself a mission of attacking the periphery of the USSR directly, in order to distract the Red Army from the Central Front in Europe. At a minimum, this would have involved missile and airstrikes against Soviet installations throughout the Far East. At a maximum, it could have involved amphibious assaults against lightly defended Soviet targets. The Naval War College examined the potential for World War III in Asia as part of its global war game exercises in the 1970s and 1980s. Played annually between 1979 and 1988, each of the games explored alternative strategic and technological aspects of a confrontation between the superpowers. Although generally focused on Europe, the games always included an East Asian component. While the early wargames saw some variance (informed to some degree by the Sino-Vietnamese War), they held to a basic pattern; the Soviets hunkered down, while U.S. and allied naval forces chipped away at the bastions and tried to distract the Russians from Europe. The United States took a more aggressive stance in the 1988 wargame. Instead of waiting for a Soviet attack, Washington immediately began air and unconventional offensives against installations in the Soviet Far East, designed to decimate Soviet air defenses and threaten the survival of military-industrial installations. For their part, the Soviets hoped that a reticent military stance and a diplomatic offensive could keep Japan out of the war. This gambit succeeded to a point, as the Japanese suspended active military cooperation with the United States. American pressure eventually forced Tokyo to yield, and the Soviet opened offensive operations against the archipelago. By this time, however, the U.S. Navy had devastated Soviet naval forces, confining the Pacific fleet to its bastion in the Sea of Okhotsk. Both the Soviets and the Americans had options in Asia. The strategic environment was far more fluid than in Europe, allowing a variety of different choices to disrupt and destabilize the opponent. This made the course of war far less predictable. At its (nonnuclear) worst, war could have raged across Asia on multiple fronts, from Korea to Japan to the Sino-Soviet border. At its best, the combatants might have observed an uneasy quiet, at least until it became necessary to outflank a stalemate in the West. But as was the case in Europe, everyone concerned is fortunate that tensions never led to open combat. This article originally appeared at The National Interest. Robert Farley, a frequent contributor to the National Interest, is author of The Battleship Book. He serves as a senior lecturer at the Patterson School of Diplomacy and International Commerce at the University of Kentucky.